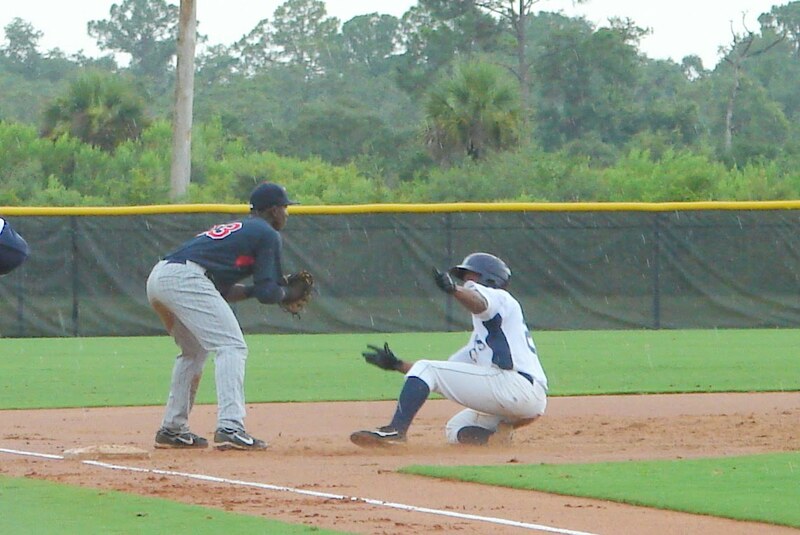 The Gulf Coast Rays lost to the Gulf Coast Twins 7-3 on a soggy Monday afternoon at the Charlotte Sports Complex. A bullpen collapse lead to four runs in the ninth combined with five errors resulted in the Rays suffering the loss. The Rays scored first in the third inning. Julian Morillo drew a walk to lead off the inning. Morillo advanced to second on a wild pitch. Then Edward Dorville tripled to center to score Morillo. Dorville would then score on a double by Joel Caminero to give the Rays a 2-0 lead. The Twins cut the lead in half in the top of the fourth. Max Kepler-Rozycki reached on a throwing error to put a runner on base. Then Nicholas Tindall doubled to center, scoring the runner and pulling to within a run of the lead 2-1. The Twins tied the game in the sixth. Eddie Rosario reached on error, followed by Kennys Vargas reaching on a catcher's interference call against Justin O'Connor. Rosario then stole third and later scored on a passed ball to tie the game 2-2. The Twins took the lead in the top of the eighth inning. Rosario and Vargas delivered back to back singles to lead off the inning. Then two consecutive wild pitches allowed Rosario to score the go ahead run. The Twins put the game out of reach with a four run ninth inning. They opened up the frame with back to back singles by Jorge Polanco and Candido Pimentel. Then Rosario reached on an error, allowing Polanco to score. Miguel Sano drove home a run with a double to left. Then Kepler-Rozycki knocked in the last two runs of the inning to give the Twins a 7-2 lead. The Rays made some noise in the bottom of the ninth with a solo home run by Seth Henry, but it was too little too late as they lost 7-3. The weather definitely took its toll on both clubs, resulting in what seemed like an increase in control problems and sloppy play. The clubs combined for 5 wild pitches, 3 passed balls, 10 walks and 5 errors. Reinaldo Lopez pitched 5 innings and allowed a run on 5 hits with a strikeout and a walk. Zach Rosscup was charged with a bad save, allowing a run on no hits while striking out 2 and walking 1 in 1 2/3 inning. Matt Spann suffered the loss, giving up a run on 2 hits with 3 strikeouts and a walk. Justin Hall surrendered 4 runs on 4 hits with 2 strikeouts in the final frame. The Rays travel to Fort Myers to rematch against the Twins on Tuesday afternoon.